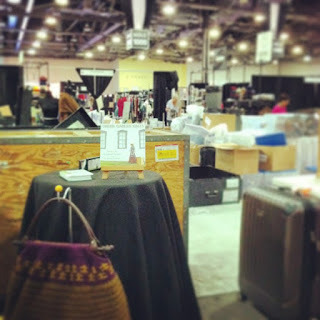 I am recently returned from TNNA, a large retail trade show for those in the needlearts industry. In the midst of all there is to show and tell at this event... I neglected to take very many photos. Alas. But I did get some, and will recap as best as I can with what I have! Of course we started out with a little knitting while waiting for our plane to board. 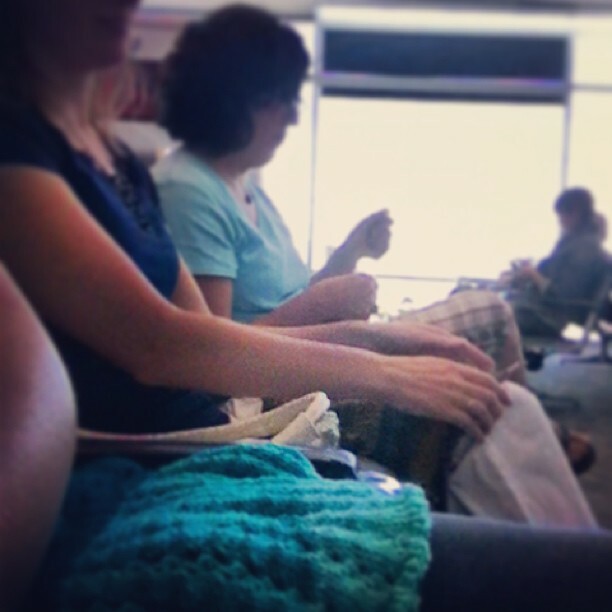 It is always interesting to see how many knitters you know while leaving Denver for the show in Columbus. This year, a kind knitter approached our impromptu knitting circle and said, "I wasn't sure if I was at the right gate, but then I saw you and knew I was!" Low and behold it was Anna, from Tolt Yarn and Wool in Washington! Love those small world moments. The next day was a busy one, as we bustled about to get the booth set up and ready to go for the show. I was honored to be at the Brown Sheep Company booth once again, which is always a wonderful experience. I love working with American made yarns, and all natural fibers to boot? Perfect! 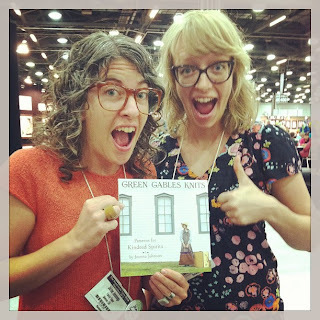 I had one project from our new book, Green Gables Knits, on display, along with a mock up of the cover and some other goodies. 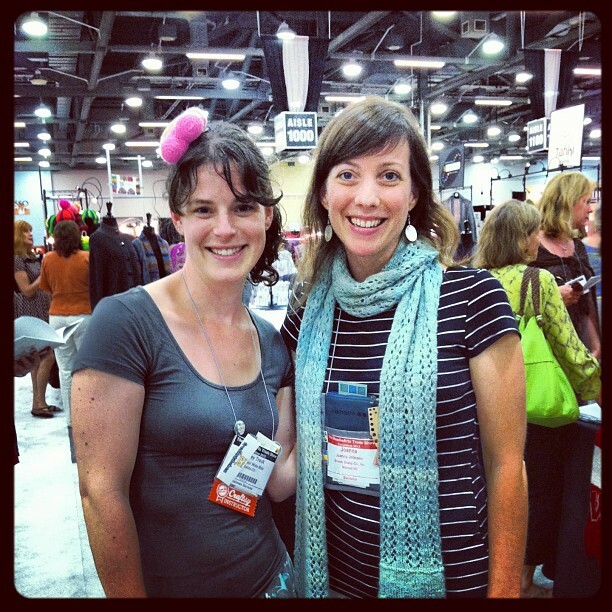 I always love to see the Fancy Tiger gals, Amber and Jaime, out at TNNA. Looks like they are almost as excited as I am about our new book! I had a great time chatting with Kara, who was attending the show with Camas Creek Yarn shop, from Kalispell, Montana. 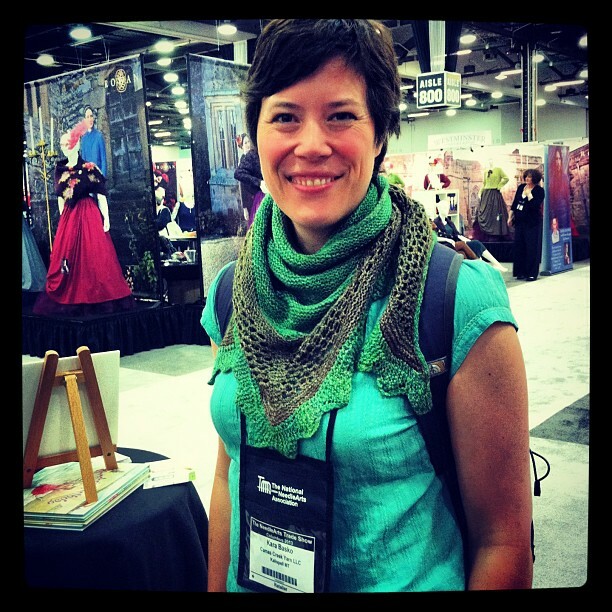 My boothmate was Melanie, from Camas Creek, who is developing an incredible line of collegiate knitting kits. Watch for them soon! There's nothing like a quiet dinner with friends after a busy day on your feet on the show floor. I was delighted to meet up with Melynda from French Press Knits and Jill from Knitterella for some food and conversation. 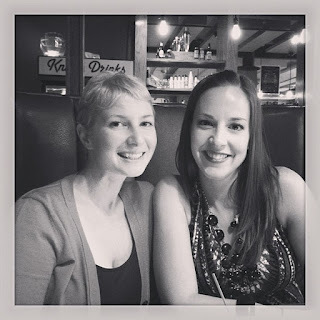 These two ladies are a delight and an inspiration! I just had to get a photo with Stacey Trock from Fresh Stitches, as our daughter is a huge fan of her crochet patterns. She is so sweet and overflowing with good ideas, I always enjoy a chat with Stacey! One thing that I am always on the lookout for at TNNA is new books. 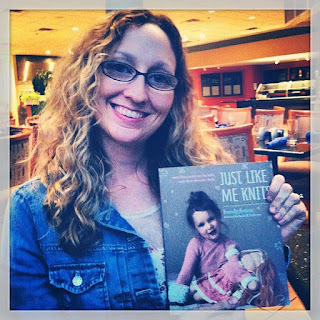 This year, I was so proud to see a brand new book by my talented friend, Brandy Fortune, entitled Just Like Me Knits. Hands down, this is THE book I am most excited about after this show. Brandy had designed an incredible collection of knitting (and sewing!) patterns for girls and their dolls. 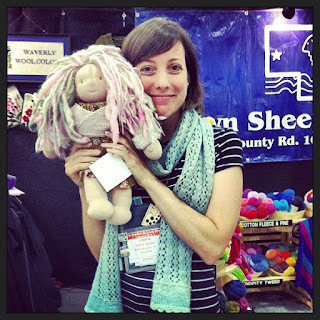 In case you haven't connected the dots quite yet, Brandy is co-editor of the lovely online knitting magazine, Petite Purls. She also happens to be an amazing photographer, and this book does not disappoint. I am fairly certain that I will be stealing this book off of our daughter's bookshelf regularly! Brandy brought by one of her adorable designs, modeled by a Fig & Me doll, to the booth. 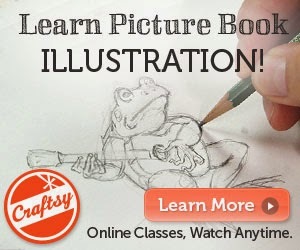 I just could not resist giving this cutie an enormous squeeze! What a wonderful time with folks at the show. Now for the very sweetest of endings... my sister and her family live not too far away from Columbus, and she had a baby girl last fall who I had not yet met. 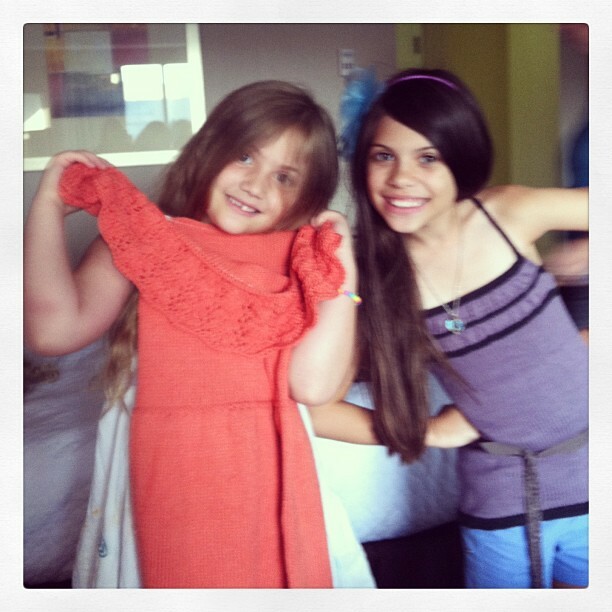 She brought her three girls to visit Aunt Jo at the fancy hotel, and we five had the best sister slumber party ever! Here are the older two girls, showing off their knits from Phoebe's Birthday, made by my sister and my mom. 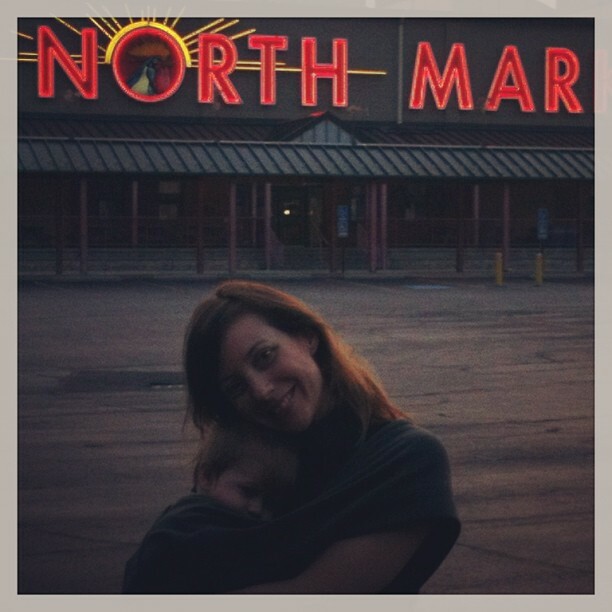 And here I am with the littlest one. It was like we were old friends! We met, she smiled at me, I made her giggle a bit, and then we went for a walk and she fell asleep in my arms. Babies are so special that way. There could not have been a better ending to my time away from my own sweet family, who were eagerly awaiting to tell me of all of their adventures when I returned home to Colorado! Oh, that baby! I can hardly stand it! 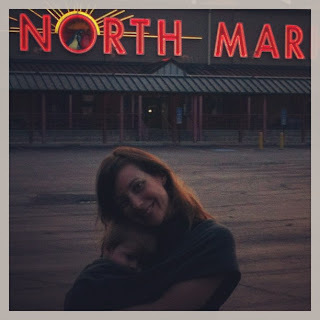 Awww...the bit about you reuniting with your littlest one got me all vorklempt. :) It reminds me a lot of the greeting I get from my own toddler when I come home from work every day. Such a precious time! It is precious, isn't it? They grow up too quickly!